it's been way too long since we had a hairless cat up in this piece. hilarious. i wonder what that little dude's voice sounds like. look at those ears! beyond adorable! You know what, I could probably survive if there was a little longer between this hairless cat and the next one. Thanks. LOVE LOVE LOVE ! they are so cute ! also, they don't shed ! major bonus points ! 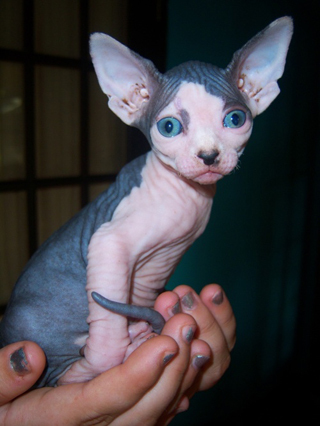 the next cat i get will be hairless -- i need a little more yoda in my life. ps to all the haters : humans are to hairless cats as regular cats are to apes. actually, i guess we are more like chinese crested dogs, but whatevs. Those wonderful eyes save him. (Well and the ears too).